MARY QUEEN OF SCOTS is yet another historical drama made on Queen Mary this time around, updated with strong feminine content and with more openness regarding sexual orientation. 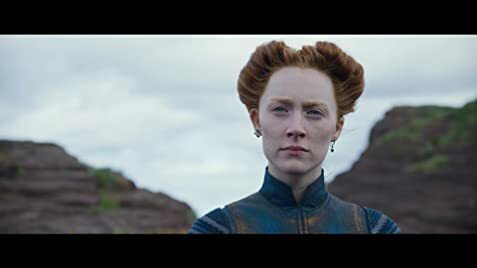 The film is directed by Josie Rourke and adapted by Beau Willimon based on John Guy’s biography My Heart Is My Own: The Life of Mary Queen of Scots. The centre of the story is the 1569 conflict between their two countries and the two queens Mary (Saorise Ronan) and Elizabeth of England (Margot Robbie). Both ladies Ronan and Robbie deliver outstanding Oscar worthy performances that keep the film an intense drama. Ronan has matured from playing teen characters as in ATONEMENT, LADY BIRD, BROOKLYN and HANNAH. Her Irish accent still comes across in her dialogue causing a slight distraction. Their confrontation scene is the highlight of the movie, though it was believed the two never met in person. The excuse: “No one must know that we have met together,” as on queen says in confidence to another. The film updates the feminist movement with Mary insisting that no male shall tell her or Elizabeth what to do. Mary is always shown in control, especially over her often drunken husband, Lord Darnley (Jack Lowden). The film also shows Mary not only a strong individual and queen but a determined and always correct one in her decisions. It helps that the film is directed by a woman. Though the film contains a few battle scenes, this is not an action picture. In fact, it is a strong female film, but one of those rare films that can also be enjoyed by both sexes. In one moving scene a humble male subject confesses that he would gladly lay down his life for his queen. Mary replies that in heaven, all will be equal. Action is substituted by high royal drama, as the too queens plan the future of their Kingdoms. Queen Elizabeth is unable to bear children. If Queen Mary bears a male boy, after married to an English protestant, her son will rule that will unite both Scotland and England. But Mary is quick to point out that when they are both dead, it does not matter who rules. The film is a handsome period piece that comes complete with stunning Scots landscape (cinematography by John Mathieson) and top royal costumes (especially the wardrobe of the two queens). Elizabeth looks sufficiently nasty with her red hair as did Glenda Jackson when she played that part in the 70’s. A brief history lesson at the end of the film explains a few facts that puts this story into historical perspective. It is mentioned that Elizabeth was the daughter of King Henry VIII and Anne Boleyn (as popularized by Charles Jarrott’s film ANNE OF THE THOUSAND DAYS) who was beheaded for not bearing the King a male child. The film also goes on to reveal that Richard, the son of Mary eventually ruled England and Scotland while Queen Elizabeth continued her rue for 14 years. 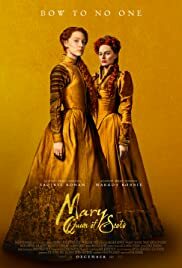 Christmas season often seems a better quality of films, and MARY QUEEN OF SCOTS, that has so far garnered positive reviews, marks a solid royal drama that I have not enjoyed since Anthony Harvey’s THE LION IN WINTER (the counterpart male royal drama). It should be noted the film’s inaccuracies that will mislead audiences. Historians insist that the two queens never met, were never cordial as friends and Mary never had a Scots but a French accent.